The bridge of the S.S. OLYMPIA as it appeared in 1953. The Engine Order Telegraph and Binnacle were removed while the telemotor and its wheel remained. Rob O'Brien collection. 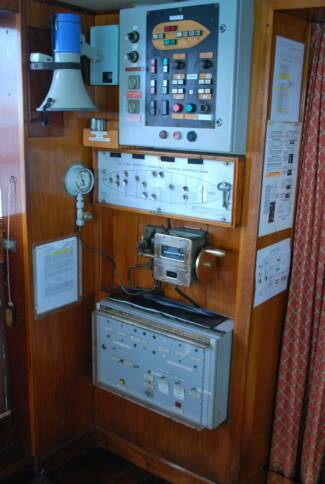 The voice of a REGAL lady, the two horns are positioned just above the wheelhouse. 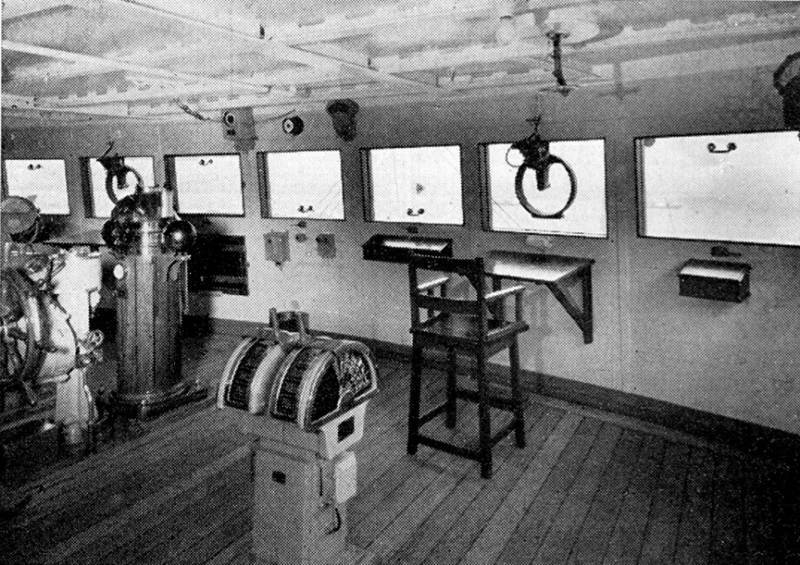 The upper navigation deck, radar mast, and "monkey island" topped off by the magnetic compass. Location of featured room on deck plan. 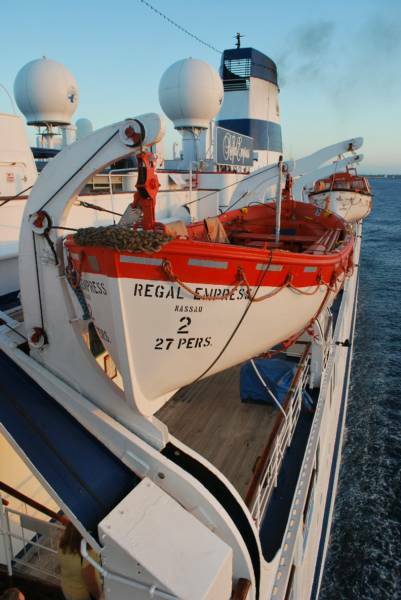 The same bridge as it appeared in 2008 on board the REGAL EMPRESS (looking starboard.) The telemotor & entire bridge were surrounded in wood paneling in later years. 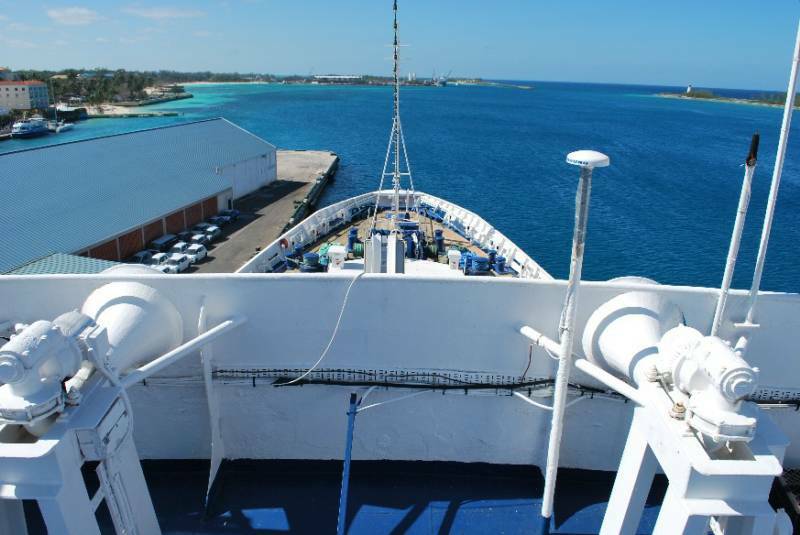 From the portside bridge wing looking aft. 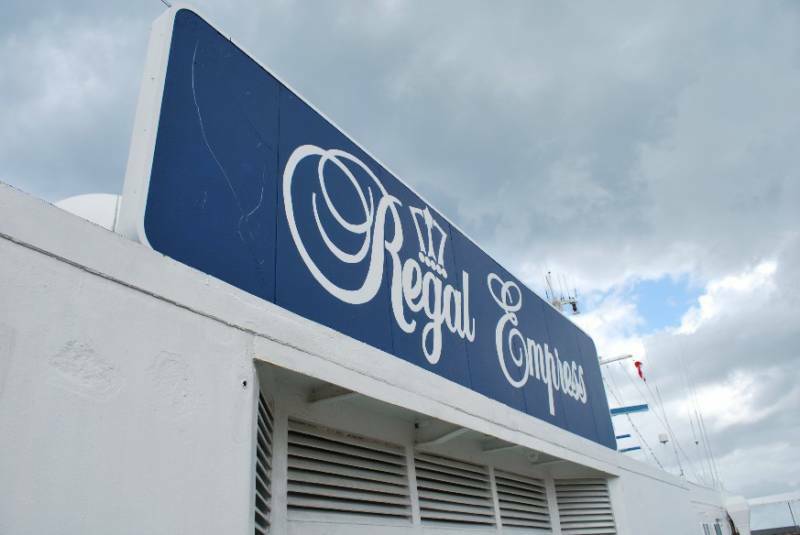 The REGAL EMPRESS name board on the starboard side, aft of the radar mast. Notice the use of the Greek Line logo above the letter "g" - echos of a long defunct company. 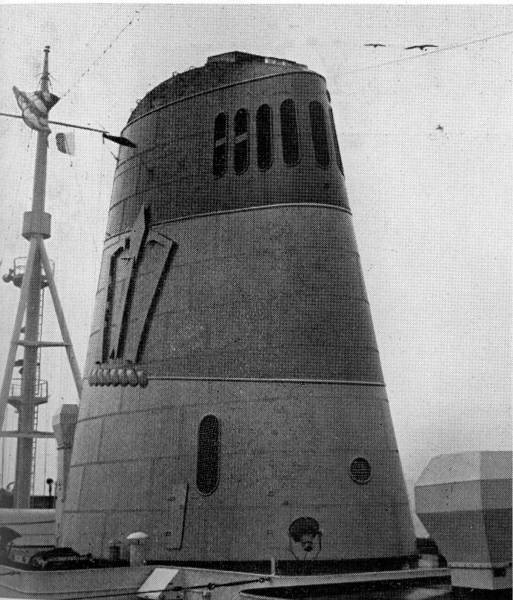 The original funnel of the OLYMPIA complete with the Greek Line logo, and the tripod mast - a most unique feature and on an ocean liner. Rob O'Brien collection. 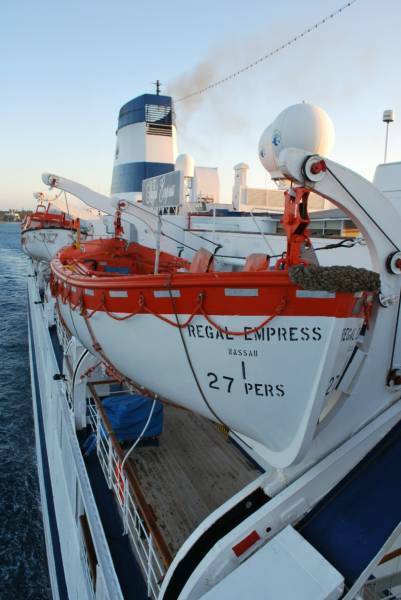 The third & final funnel of the REGAL E. Looking forward on the starboard side. 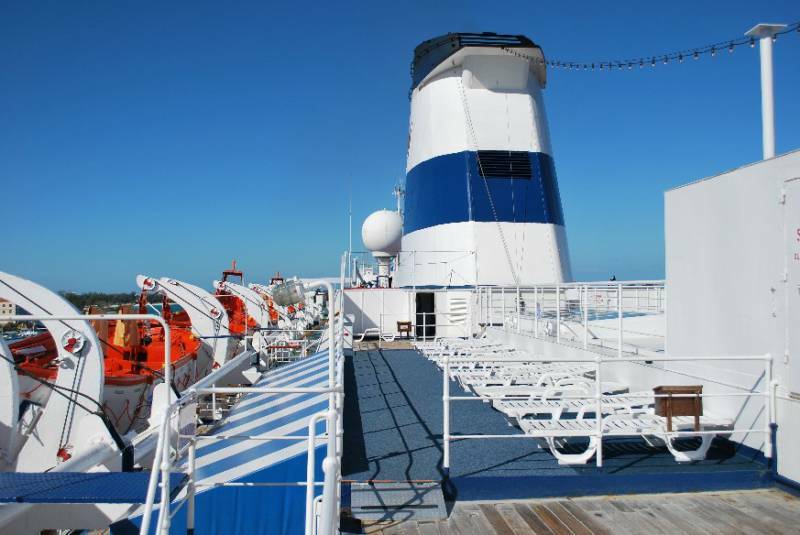 The Sunning Area, just aft of the funnel on the port side, looking forward. 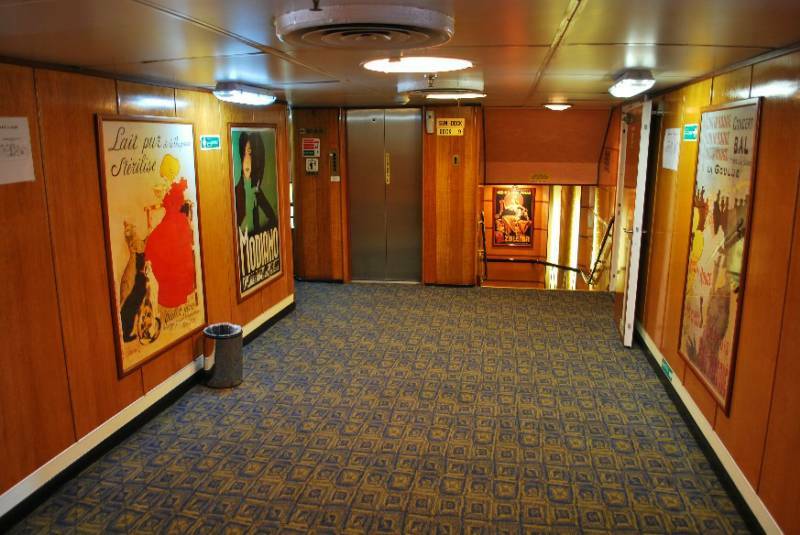 Radio Square, with art deco themed posters on Sun Deck, facing aft. 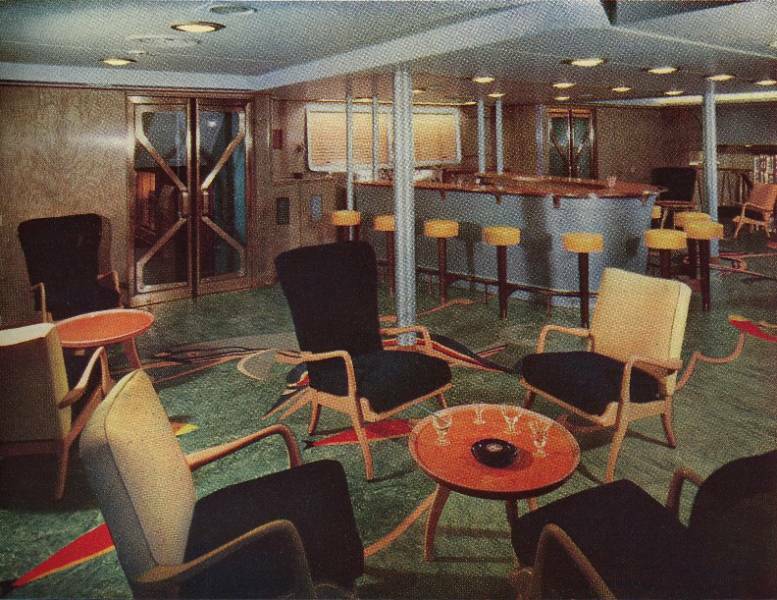 The 1st class Aegean Club as it looked in 1953 on-board OLYMPIA. Rob O'Brien collection. The same room, 55 years later. Wood paneling and brass doors remained intact during that entire time. 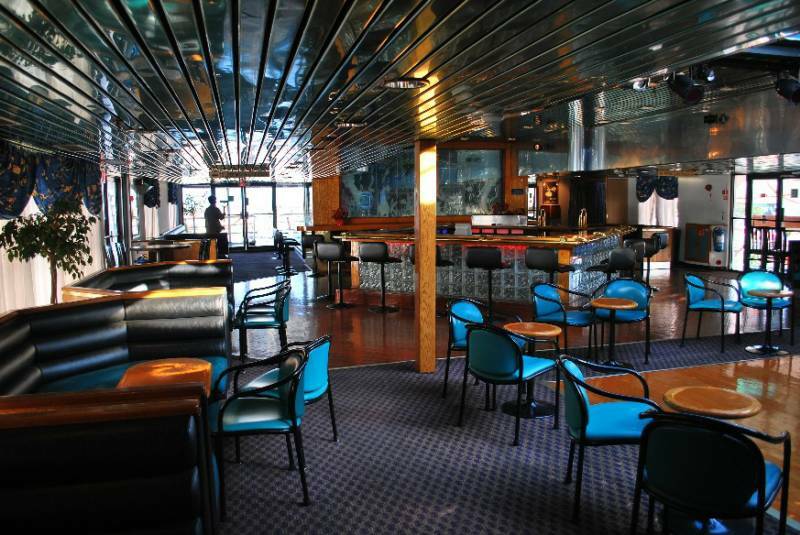 The starboard side sunken wing of the Commodore Club/Lounge. 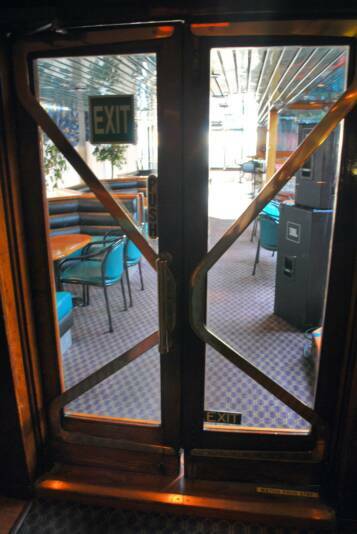 The port side wing alcove of the Commodore Club, looking forward. The perfect place to have a drink and hear a favorite piano tune..
From here one can leave a sea of wood paneling and access their lifeboat stations. 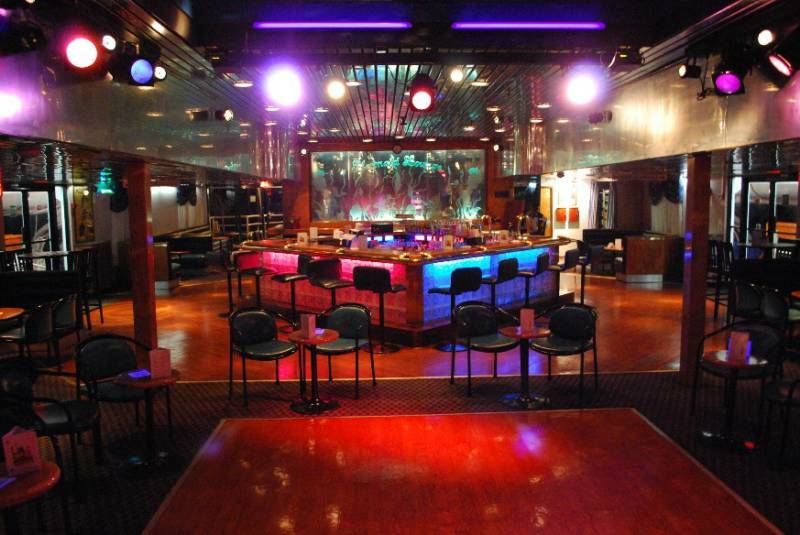 Just aft of the Commodore Club and thru the doors seen above is the Mermaid Lounge. 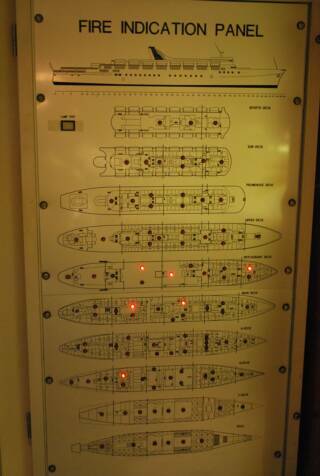 This view is looking aft on the starboard side. 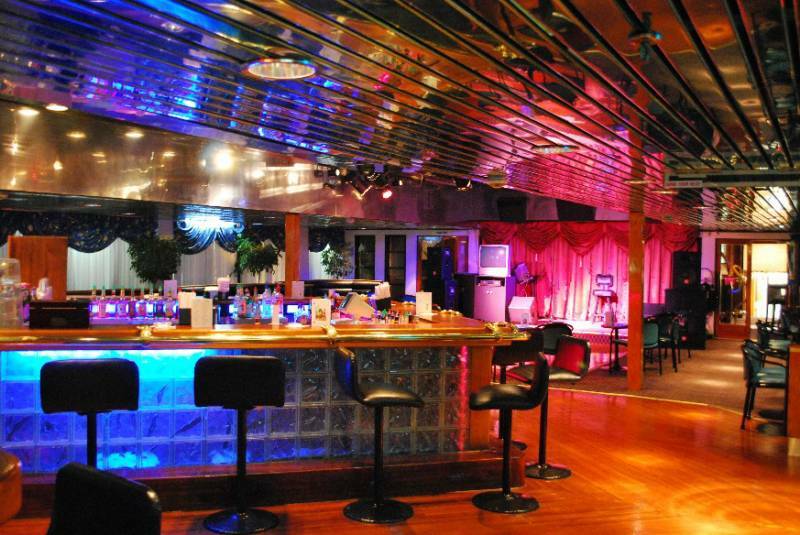 A night view of center stage for those doing karaoke. 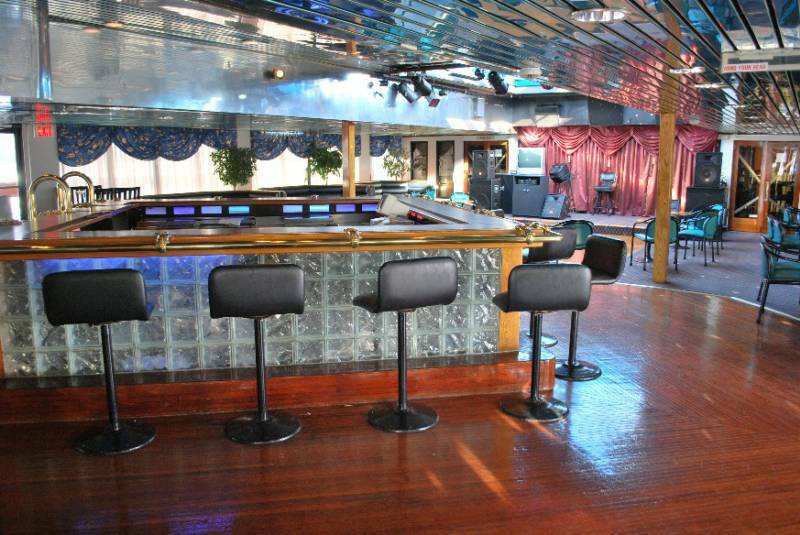 A daytime and night view of the Mermaid Lounge with the bar at the left, both looking forward/port. 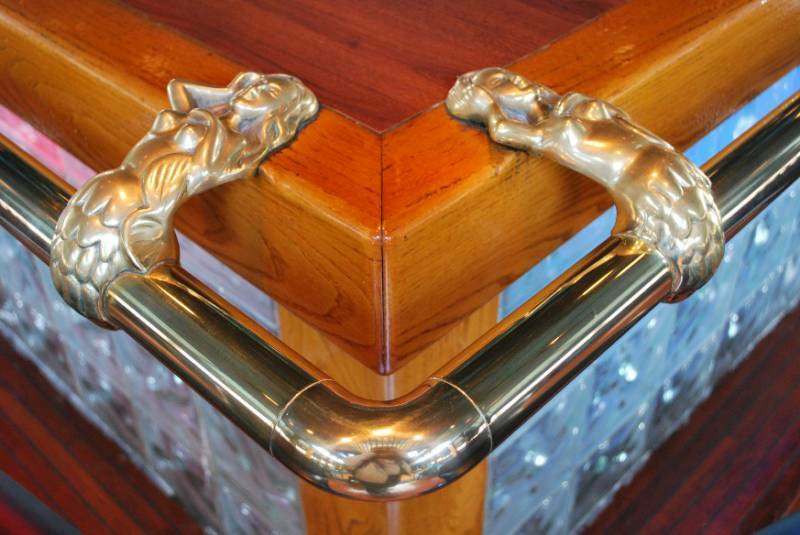 These golden ladies greet you at the bar of the Mermaid Lounge. 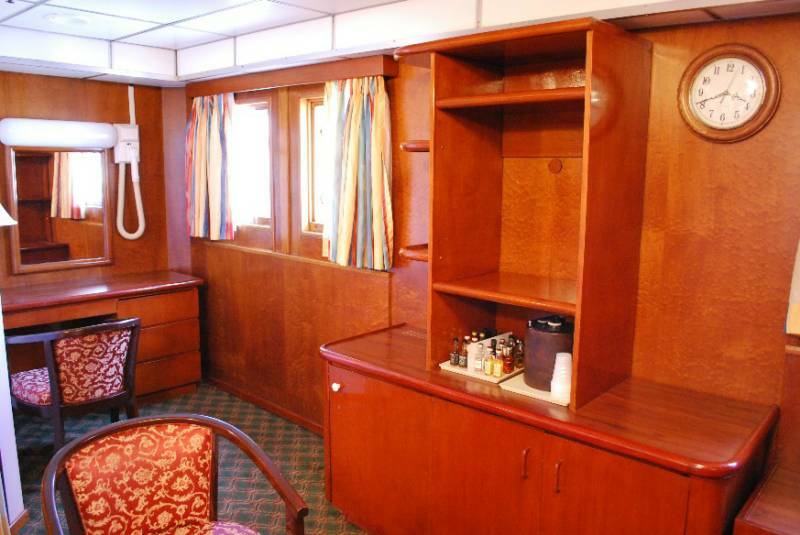 One of the finest staterooms onboard, Admiral Suite 1 located on the starboard side of Sun Deck, all the way forward. The bedroom of Admiral Suite 1, the enite area features original wood paneling from OLYMPIA days. 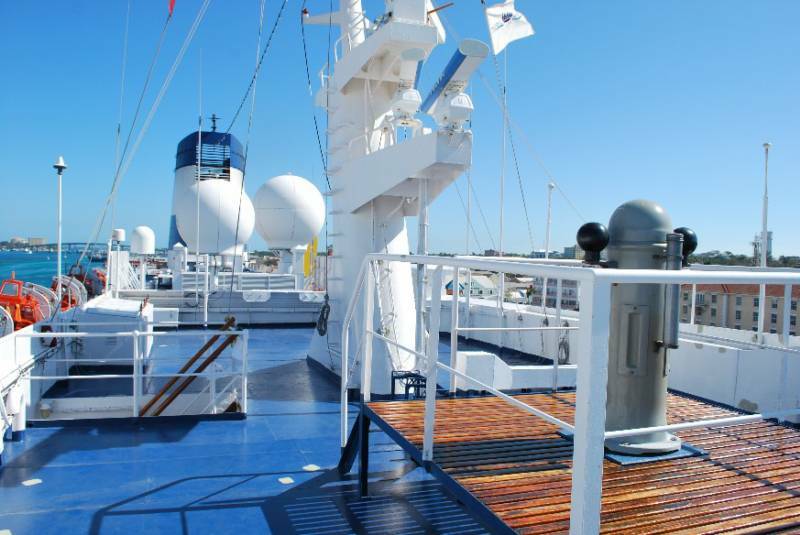 Facing forward in the spacious Suite 9 on the starboard side, located on Sun Deck. 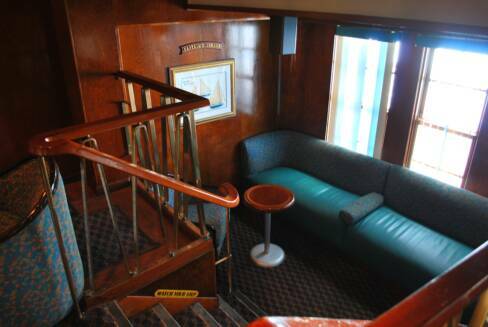 Suite 10 on the port side, also features wood paneling and original brass windows. 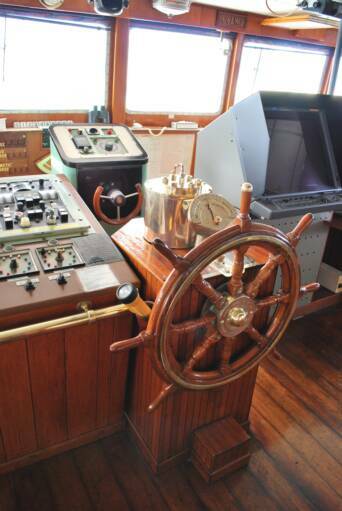 The helm and its original steering wheel in the foreground is an auxilary (used only as a backup), while the helm forward of this was the actual helm used in everyday operations. The fire panel on the left was located in the chartroom, installed during early Commodore days as evident by the funnel in the etched profile. 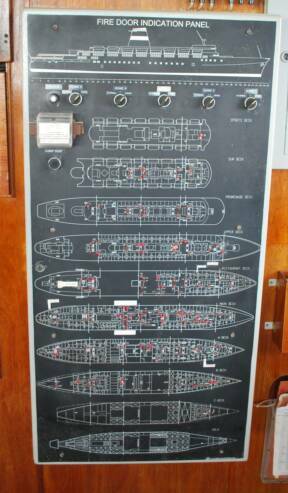 The other panel on the right was located on the aft bulkhead of the bridge. 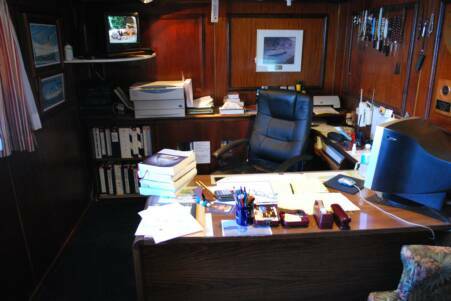 One would find the Captain in his Office performing day to day operations from his desk (above). 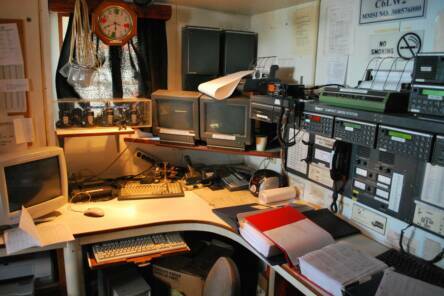 The GMDSS station (below); before 1997 all onboard bridge communications took place in the old Radio Room before the changes made the Radio Officer obsolete. 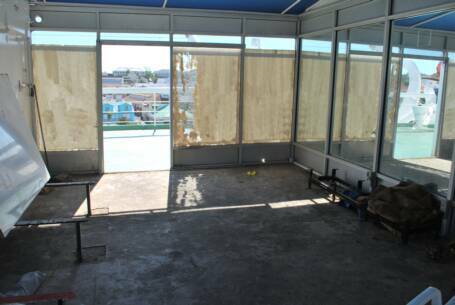 This empty & neglected space has seen better days when used as the ships Fitness Room on the same deck aft of the bridge. 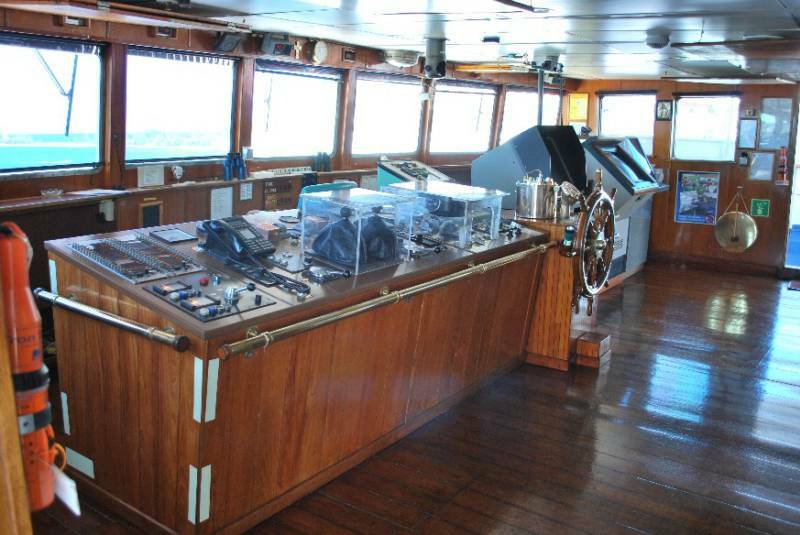 Brass & wood alone still shine today in this view port side looking starboard, with enough seats for 35 people. 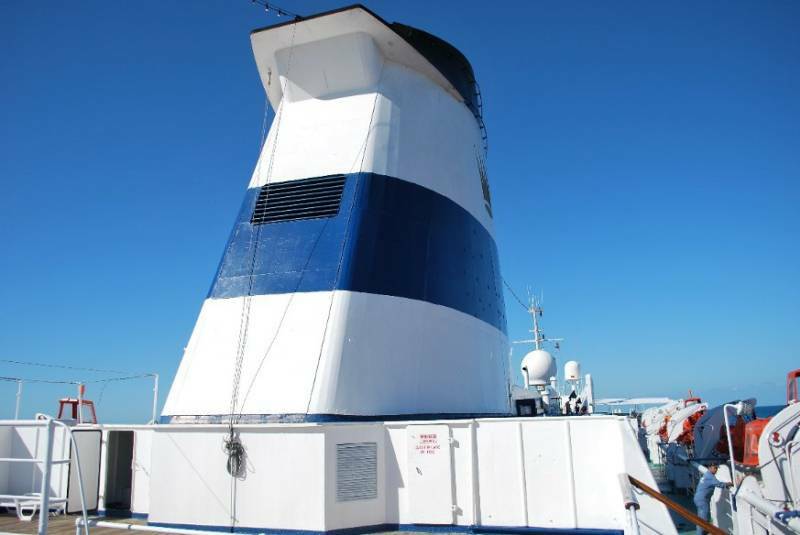 The starboard side looking port. The piano dominates the foreground to the right. The wood polished handrails with brass zigzag design and glorious wood paneling are among the original features of this room. 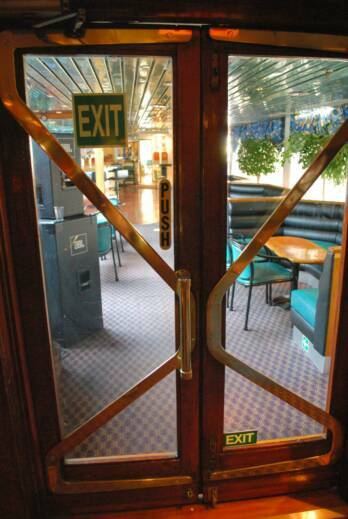 Seperating the Commodore Club and the Mermaid Lounge are these two interesting and original brass doors, with the starboard side on the left and port side on the right. This large beautiful etched mirror faces forward towards the bar.